Hebrews 12:1-2… Wherefore seeing we also are compassed about with so great a cloud of witnesses, let us lay aside every weight, and the sin which doth so easily beset us, and let us run with patience the race that is set before us, Looking unto Jesus the author and finisher of our faith; who for the joy that was set before him endured the cross, despising the shame, and is set down at the right hand of the throne of God. As we begin 2013, let’s take a few moments to review the advice given to us by the writer of Hebrews found in Hebs 12:1-2. This Scripture tells us about four key spiritual principles to retain the absolute commitment in the service of Christ…. We can remain totally committed to Christ by …. Who is this “cloud of witnesses?” It is the many different men and women spoken of in Hebs 11:, that remained committed to their Lord as they faced many different obstacles to their service. As we begin this New Years Day let us remember these saints of the Bible, as well as, the other Godly saints living in our day who are setting the example for us of faithfulness and willingness to sacrifice for Christ and His work. In this passage, we are told to put off two different hindrances to service: “every weight” and “sin”. A “weight” involves the cares, tribulations and hardships that this world has to offer. On the other hand “sin” is referring to those times when we fall short of His desires and commands for our lives. As we prepare for this New Year, let us exercise faith, laying our “weights” upon Christ; be vigilant avoiding sin; and through repentance dealing with the sin that slips into our life; we can be better prepared for faithful service in 2013. Great patience is needed in our walk with Christ. In our prayer life, in the reaping a harvest from the seeds of faith we have sown, in waiting for the coming of our Lord, in every aspect of our service we have a great need for patience as we face seeming delay after delay after delay. As we begin our New Year of service we should be prepared for times calling for our patience, remembering these times come upon us for our good, to help us grow and mature in the faith. Our New Year should begin, continue and end with our eyes upon our precious Savior as the chief motivation for our service to Him. By thinking of who He is and what He has done for us, we will by His grace remain faithful servants of the One who has given His all for us. May we all take a moment to reread Hebs 12:1-2 and ask the Lord to grant us the grace we need to be rededicated to serving Him as we begin another year of obedience to Christ. Although the Lord originally gave this promise to the believers in the physical nation of Israel… in today’s time this promise applies to all believers (both Jewish and Gentile) who make up His spiritual nation of Israel. (Gals 6:14-16). As we begin the New Year, as believers in Christ, let us remind ourselves of this precious promise and the great hope that awaits us in the coming year. Here we find a clear declaration from our Lord concerning His plans and watch care for our lives. The Lord makes 3 basic declarations in this verse. “For I know the thoughts that I think toward you”. – First of all, the Lord tells us that He personally makes individualized plans for each of our lives. He does not rely on others to plan our lives, nor does He simply allow our lives to go unguided and protected. He has invented a plan for each of us. This plan includes…. “thoughts of peace and not of evil” – the purpose of these plans is to bring to us prosperity and good, not sorrow and troubles. By simply seeking His will for our lives, and then following that will, He will allow our lives to be successful in our endeavors for Him. By following His plans our lives will be spiritually prosperous and in harmony with our Lord. These plans will not lead us into sin, sorrow or spiritual trouble. Romans 8:28, reveals this same principle to us… And we know that all things work together for good to them that love God, to them who are the called according to his purpose. “to give you an expected end” – Third, The Lord tells us what the result of this truth should be for our lives…. An expected end… in other words, a future that we can place our hope and confidence in. By understanding that the Lord has planned our lives in advance, and knowing that those plans will result in our good and spiritual prosperity, why should we not be hopeful and looking forward to a bright future for each of us? The ability to discern, follow, and patiently do His will for our lives can be a very difficult task. In Daniel we have the perfect example of a King who rejected God’s will for His own will and had to learn a very difficult lesson. 29At the end of twelve months he walked in the palace of the kingdom of Babylon. 30The king spake, and said, Is not this great Babylon, that I have built for the house of the kingdom by the might of my power, and for the honour of my majesty? 31While the word was in the king’s mouth, there fell a voice from heaven, saying, O king Nebuchadnezzar, to thee it is spoken; The kingdom is departed from thee. 32And they shall drive thee from men, and thy dwelling shall be with the beasts of the field: they shall make thee to eat grass as oxen, and seven times shall pass over thee, until thou know that the most High ruleth in the kingdom of men, and giveth it to whomsoever he will. 33The same hour was the thing fulfilled upon Nebuchadnezzar: and he was driven from men, and did eat grass as oxen, and his body was wet with the dew of heaven, till his hairs were grown like eagles’ feathers, and his nails like birds’ claws. 34And at the end of the days I Nebuchadnezzar lifted up mine eyes unto heaven, and mine understanding returned unto me, and I blessed the most High, and I praised and honoured him that liveth for ever, whose dominion is an everlasting dominion, and his kingdom is from generation to generation: 35And all the inhabitants of the earth are reputed as nothing: and he doeth according to his will in the army of heaven, and among the inhabitants of the earth: and none can stay his hand, or say unto him, What doest thou? 36At the same time my reason returned unto me; and for the glory of my kingdom, mine honour and brightness returned unto me; and my counsellors and my lords sought unto me; and I was established in my kingdom, and excellent majesty was added unto me. By patiently seeking the face of the Lord, and doing His will, we can be confident of what the future holds for us. We can count on the fact that by simply serving Him our future will be filled with hope and spiritual prosperity. The first step towards spiritual peace and prosperity is found by trusting the Lord with our past present and future. Trust that He died on the cross, paying the price for the sins of His people. Come to Him in a spirit of remorse with a willingness to turn from our sins and accept Him as the Lord of our life. From that point forward we can know that He is leading and guiding us and preparing us a wonderful future of peace, and spiritual properity. And we can know that our future will culminate in having a perfect, eternal habitation that He has prepared for us. 1) Let not your heart be troubled: ye believe in God, believe also in me. 2) In my Father’s house are many mansions: if [it were] not [so], I would have told you. I go to prepare a place for you. 3) And if I go and prepare a place for you, I will come again, and receive you unto myself; that where I am, [there] ye may be also. 4) And whither I go ye know, and the way ye know. As New Year’s Day approaches, we all have a tendency to reflect upon the events that have taken place in the previous year and look forward to what the coming year may hold for us. Although this earthly experience of a new beginning is profitable, there is an even greater time of new beginnings that is offered to us in the pages of the Bible. I would like us to look at this wonderful time of “new beginnings” that is graciously offered to us through the grace of the Lord Jesus Christ. We find teaching summarized in 2 Cor 5:17. As we quickly approach the New Years, let us all keep in our minds the new beginning that our Lord has graciously given to us. By His grace, motivated by His love for us, He has made us into “new creatures” allowing us to put behind all of our “old things” and being able to experience a newness of life in Him. Let’s praise and honor the One who has given us such a wonderful set of blessings to us. Finally, please remember that our praise to Him should not be limited to our speech, but should encompass our actions as well. This means during our New Year’s celebration we should keep our minds on our Lord and His workings, and celebrate the New Year in a way that is God honoring, setting the example for all those around us. We can do this by putting aside the “old things” (drunkeness, gluttony, and the such like) and putting on the “new man” dedicated to pleasing our Lord. When We Become New Creatures in Christ, it is a New Beginning for Us. The “Old Things” of our Lives No Longer Eternally Applicable to Us; it is as if We Begin our Life Anew. As New Year’s Day approaches, we all have a tendency to reflect upon the events that have taken place in the previous year and look forward to what the coming year may hold for us. Although this earthly experience of a new beginning is profitable, there is an even greater time of new beginnings that is offered to us in the pages of the Bible. I would like us to look at this wonderful time of new beginnings that is graciously offered to us through the grace of the Lord Jesus Christ. We find teaching summarized in 2 Cor 5:17. In summary, these old things are “turned away” from us, no longer being held accountable for them; in other words, it is as if they are “ignored” by God; or in that sense, they have “gone out of existence”. Although this phrase has these varied meanings, the basic principle can clearly be seen. When we become new creatures in Christ, the “old things” no longer have eternal effects in our lives. Keeping this in mind, we can see that when we become new creatures in Christ, it truly becomes a new beginning for us. All the “old things” are no longer eternally applicable to us; it is as if we begin our life anew. But, obviously, the next question is this… what are some of the “old things” of which this verse speaks? What are the things that no longer have eternal results in our lives? What a blessing and joy it is to know that the “old things” of our lives are passed away and, through His gracious work on our behalf, all thing s have been made new. Our Saviour, Christ The Lord… Let’s Set Our Hearts To Honor Him Throughout The Holiday! 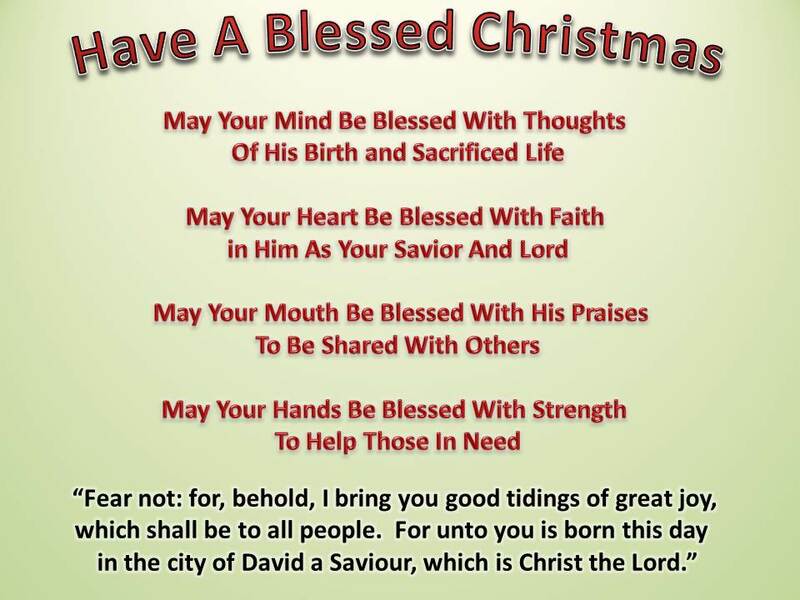 Luke 2:11 (KJV) For unto you is born this day in the city of David a Saviour, which is Christ the Lord. Luke 2:10-11 (KJV) 10) And the angel said unto them, Fear not: for, behold, I bring you good tidings of great joy, which shall be to all people. 11) For unto you is born this day in the city of David a Saviour, which is Christ the Lord. The news given to the shepherds by the angels of God, was news that would change the course of all mankind. This news was a declaration of the long awaited Messiah’s entrance into the world resulting in His work which accomplished the redemption of sinners and His reign in the hearts of men. In our continuing look at Jesus’ first coming to the earth, let’s take this morning to complete our look at this wonderful announcement of the birth that forever changed the world…. The promised Christ is also described here as “Lord” or “Ruler”. At His first coming He secured His rulership over all by obtaining victory over Satan, sin and death (Heb 2:14, Roms 8:1-4). Based upon His faithfulness to the Father, He has received the sovereign authority to rule over all the world (Eph 1:21-22). He obtains the willful submission of His people as He rules in their hearts (Luke 17:20-21) while He Sovereignly controls those who do not recognize, nor seek to submit to, His commands (Col 2:8-15). He truly is Lord over all. It is the first coming of the Messiah that we will be celebrating in the days ahead. As we enjoy our Christmas exchanging gifts with our family, friends and acquaintances, let’s remember that this is the world’s day to commemorate the greatest gift that was ever given. It was the Messiah, the very Son of God, given by God the Father, for the salvation and rulership over all the world. Let’s keep Jesus in the forefront of our minds as we celebrate His birth on Christmas Day. Luke 2:10-11 And the angel said unto them, Fear not: for, behold, I bring you good tidings of great joy, which shall be to all people. 10) And the angel said unto them, Fear not: for, behold, I bring you good tidings of great joy, which shall be to all people. In our continuing look at Jesus’ first coming to the earth, let’s take two mornings to look at this wonderful announcement of the birth that forever changed the world. If we put ourselves in the place of these shepherds, it is no wonder that the first words out the mouth of this angel was “fear not”. What a wonderful, yet fearful event it would be to see an angel appearing out of nowhere to deliver a message to you and your friends. But then, you would hear the comforting words…. “fear not”! Why should they not be fearful? It was because the angels had not come to harm them. They had come to deliver news that would hold great benefits and an overflowing joy to the shepherds and the entire world. In the next verse, we are told that their message was a declaration of the birth of the Messiah. No wonder they described their message as being one of “great joy”. It would be through the Messiah’s coming, His teachings and His works that men would find eternal life, forgiveness of sins, and peace with God. Of course, these results of the Messiah’s ministry would bring great joy to the hearts of those who would place their trust in Him. It is this first coming of the Messiah that we will be celebrating in the days ahead. As we enjoy our Christmas exchanging gifts with our family, friends and acquaintances, let’s remember that this is the world’s day to commemorate the greatest gift that was ever given. It was the Messiah, the very Son of God, given by God the Father, for the salvation and rulership of all the world. Let’s keep Jesus in the forefront of our minds as we celebrate His birth on Christmas Day. December 22, 2012 7:00 pm / 1 Comment on We KNOW He Is Coming Again…. He Promised It! Christ Hasn’t Come Back… Why Believe That He Will? 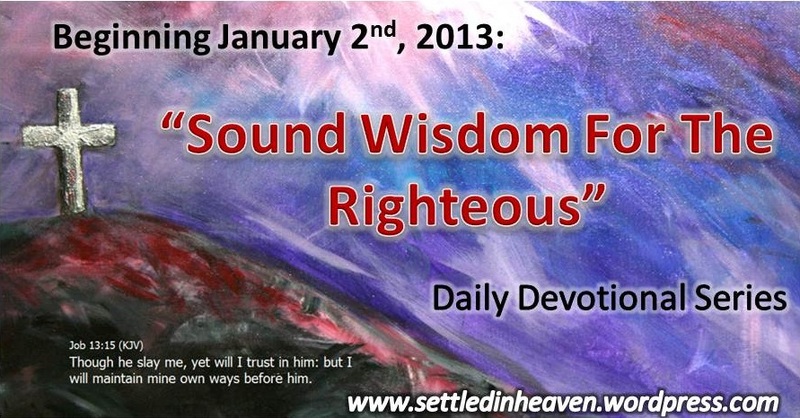 December 22, 2012 7:00 am / 3 Comments on Christ Hasn’t Come Back… Why Believe That He Will? During this same period of time, we have seen “signs of the times” come and go all seemingly telling us that Christ is coming soon…. and, so far, with no results. With an absence of His coming after 5000+ years of promises, what are we to think? Why should we continue to believe He is coming again? 4) And saying, Where is the promise of his coming? for since the fathers fell asleep, all things continue as [they were] from the beginning of the creation. 7) But the heavens and the earth, which are now, by the same word are kept in store, reserved unto fire against the day of judgment and perdition of ungodly men. 8) But, beloved, be not ignorant of this one thing, that one day [is] with the Lord as a thousand years, and a thousand years as one day. 9) The Lord is not slack concerning his promise, as some men count slackness; but is longsuffering to us-ward, not willing that any should perish, but that all should come to repentance. Peter describes to us the purpose for his writing of Second Peter. He tells us that he is writing this to remind Christians of the teachings of the Old Testament prophets, as well as the responsibilities that had been placed upon them by the Apostles. Both the OT prophets, and the NT Apostles, presented to the world teachings concerning Jesus the promised Savior. It is this same Jesus who was King of Kings and Lord of Lords, the One we are all responsible to follow and serve. Knowing this first, that there shall come in the last days scoffers, walking after their own lusts, And saying, Where is the promise of his coming? for since the fathers fell asleep, all things continue as [they were] from the beginning of the creation. Christians living in the times between Christ’s first and second comings will always be faced with those who deny and mock the promises of God. Of these Divine promises, one of the greatest is the assurance of Christ’s second coming to this world in judgment. A chief argument of scoffers is that since the second coming has not happened during the generations of our ancestors, why should we believe it will happen in our generation, or the next? The promise of His second coming extends back well into the Old Testament times of the prophets. If after 5000+ years He has not come back, why should we think anything will be different now? Peter now begins a list of truths that these scoffers refuse to acknowledge as truth (“willingly ignorant of”). Although these truths are displayed plainly to man, they choose to disregard them as they continue in their denial of His second coming. Truth #1 – The same powerful, reliable Word that was the instrument of the creation and continuance of this world, is the same steadfast Word that guarantees His second coming. In Gen 1: we are told that this world was spoken into existence by our Lord. Further, we are told that it is this same Word that is used by God to hold everything in its place (Hebrews 1:3). If we understand these principles, we also understand that the consistent existence of creation is an unceasing proof of the power and reliability of the Word of God. Therefore, using the perpetual continuance of this world to deny His second coming is faulty reasoning on the part of scoffers. In actuality, the enduring presence of this world is proof that the promises for his second coming come from an absolutely reliable source… the Word of God, thus ensuring the occurrence of His second coming. Principle #2 – In His reliable Word, we find that the world was universally judged due to mankind’s sin. If the world was historically judged in this way, it is reasonable that a Just God is obligated to judge an equally sinful world in the future. Based upon the sinful condition of the unsuspecting world and its continual rejection of the truth obligates the second coming of Christ to judge the world for its sin. The justice of God renders certain His second coming and the judgment that is to come. Peter once again reminds us that the latter days in which we are living continue on simply because the heavens and earth are being “kept in store”. In other words, they are held in reserve until God’s judgment arrives. At that time the wicked will stand before God, a verdict of “guilty” will be rendered by the Almighty (judgment), and then the lost will be permanently consigned to an eternity of punishment for their sins (perdition). This judgment will also affect the earth and will be by fire as the Lord consumes and purifies this creation from the sin that has filled it. (2 Pet 3:10) This will then make way for the new heavens and new earth that will be our eternal dwelling place (Rev 21:). Note that His judgment is said to come at “the day of judgment”. In other words, God has a set time for his second coming and the following judgment of the world to take place. It is the “day” that has been appointed (Acts 17:31) for His righteous judgment to fall. Principle #3 – In the Lord’s perspective there is no such thing as time. Based upon the absolute certainty of the fulfillment of His eternal counsels His second coming has already taken place. Another very important point to remember is that, from our perspective, His second coming seems to be delayed and that much time has elapsed between the OT prophesies and their fulfillment at His second coming. However, from God’s perspective this time delay is a non-issue. In God’s view, the second coming is already a completed act. In the counsels of God, what He has decreed is already accomplished…. NOTHING can stop His plans from attaining fruition, they are “as good as done”. Much like His decree to save us renders us already “glorified” in His sight because of the certainty of its occurrence (Rom 8:29-30). In the same way, believers in the Old Testament are saved from their sins through the shed blood of Christ although He had not yet died (Heb 9:11-14). In God’s counsels the death of Christ was already accomplished and therefore, its merits could already be had by men in the Old Testament days (Rev 13:8. 1 Pet 1:19-20). From God’s standpoint, in actuality, the second coming has already taken place. It is done. But from man’s perspective, why has there been such a long “storage period” for this world? Why is His second coming delayed for such a long period of time? As a part of his eternal counsels, He has placed a long time period between prophesies of His second coming and the second coming itself so that His chosen people can come to repentance and belief in Him. Remember, He will not lose any of His chosen ones (John 6:38-40, John 10:27-30 John 18:9). He is working during this time period of delay to bring all of his elect to repentance and faith. What wonderful, loving, merciful and PATIENT Lord we serve! What a wonderful blessing to know without a doubt that this same Lord is coming again to take His people home to live with Him for an eternity. What a solemn, sure warning we have of His coming time of judgment against sin. What a wonderful act of God’s grace in giving us this forewarning of His coming judgment. In response the great needs of our life is to change our attitude about our sin and Christ, turn from that sin and turn to Christ for forgiveness, salvation and a sure eternity with Him. If you have any questions about salvation you are welcome to email me at settledinheaven@gmail.com. I’ll be more than happy to answer any question you may have. Isa 7:13-14 (KJV) And he said, Hear ye now, O house of David; [Is it] a small thing for you to weary men, but will ye weary my God also? Therefore the Lord himself shall give you a sign; Behold, a virgin shall conceive, and bear a son, and shall call his name Immanuel.